The worst of the rain stayed on either side of us and our group of 5 stayed relatively dry for most of the ride. Only started coming down a bit harder as we were on our way out. We got some wheels on the beginnings of 'Trail 4' out and back. So far so good. I was able to actually ride most of it, its a challenging climb and Jesse and crew are just getting to the good stuff with some rocky ridge terrain. Looks like the rest is going to be very interesting. I'm looking forward to my schedule opening up this fall and getting in there to help. Great ride at Franklin Falls last night. Good group of about 7-8 riders, which means a good number of wheels packing down our new trail, Sniper. We rode it in both directions (not sure which way I like better yet) and some sections are already ridden in nicely and the others will come right along as long as we keep doing what were doing. For any who have yet to ride Sniper and are wondering where it is, we have updated our FFD trail map and it can be found on our Trail Maps page. Last night was I think the first night that I really realized that all that glorious summer daylight is starting to fade a bit quicker. We'll have to be more efficient for the next few weeks to get our mileage before the darkness creeps in and then it'll be time to bust out those lights! Adam G. with the Greater Boston Chapter is coordinating. 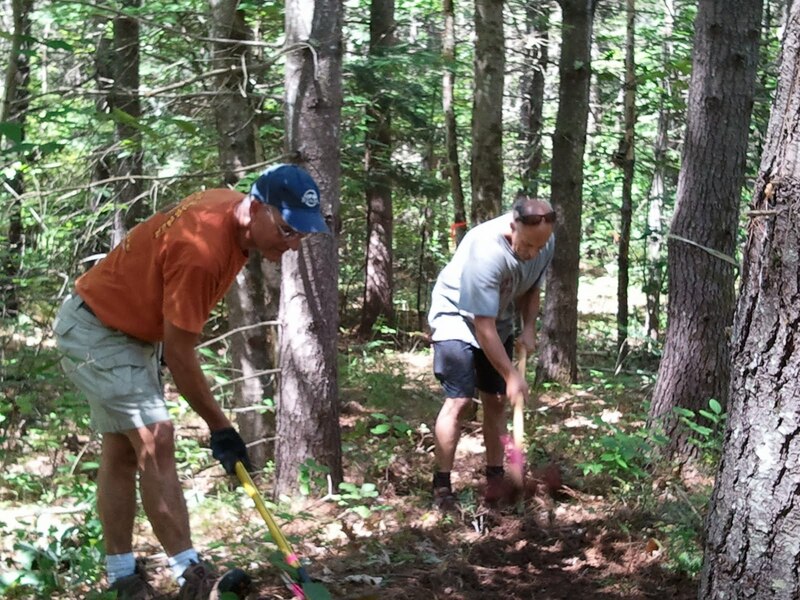 Come join us Sunday Aug 14th as we help create the start of a cross country trail system at Highland Mountain! We'll be starting in the morning at 8am and working all day until 5pm in two waves. 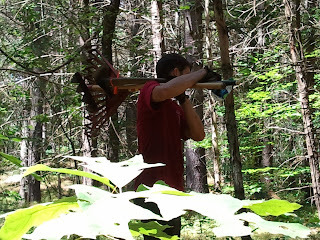 Here's the deal: come build trail for a half day and you get to ride the lift-served trails the other half for free. We cover your lunch, too. 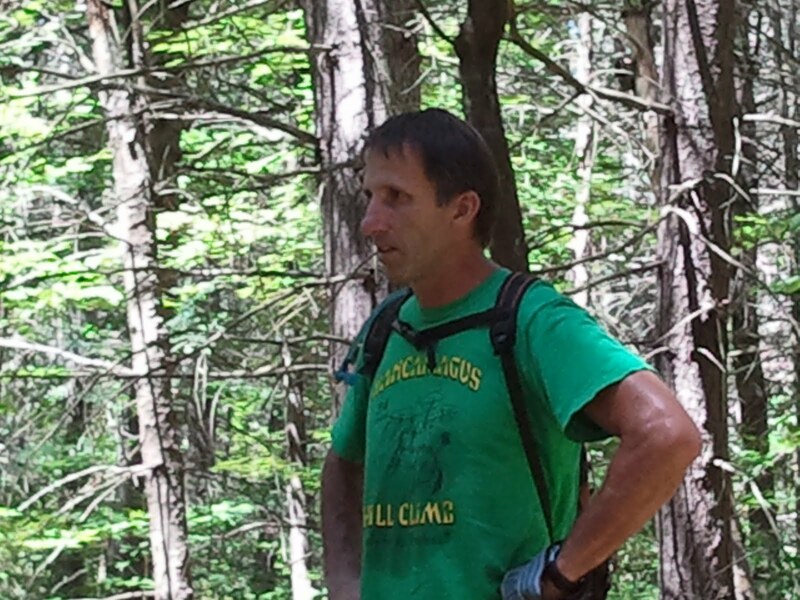 What you need: water bottle, clothing suitable for trail building, work gloves if you have them. We will provide tools and training. Volunteers will be organized into build first/ride second and ride first/build second groups that will swap roles after lunch time. We kicked off the Tuesday Night Trailwork series at Page Hill last night despite a little wet weather. 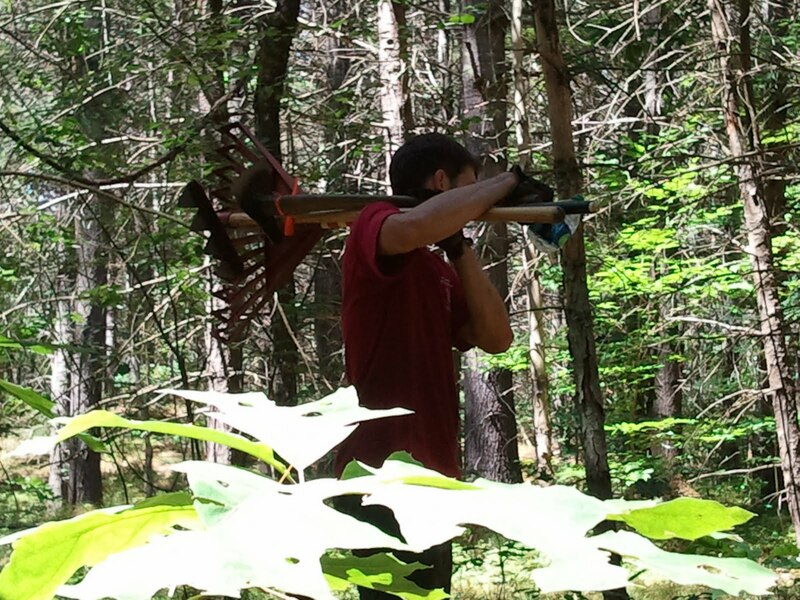 Using a seatpost rack, I lashed a rogue hoe, fire rake, leaf rake and loppers to my bike and we rode out the the Northwest side of the property. The load's effect on the handling of the bike was noticeable, but riding was still faster and much more fun than lugging tools out there on foot! 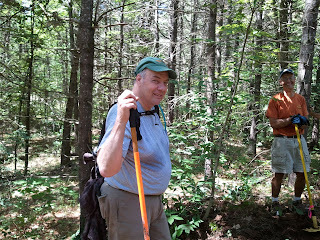 We roughed in a short section of trail that we a had flagged earlier. For now, the entrance to the new trail is hidden, but we'll open it up once we get a section completed. Our next official TNT is August 23rd, but contact me if you would like to get out there sooner to check it out. Judging by last nights turnout, I'm guessing that this is a big vacation week or nobody can take the smell of my bike shoes anymore (I'm pretty sure a diseased chihuahua died in them). Maybe that's what they mean when they say 'the dog days of summer'. The ride started up with just 2 of us (2 others caught up later on) and we folded the new trail Sniper into the mix. It will take a while to find the optimal trail order with Sniper online now, but we decided to do the following route: Start with Rogue and move on to Whaleback. 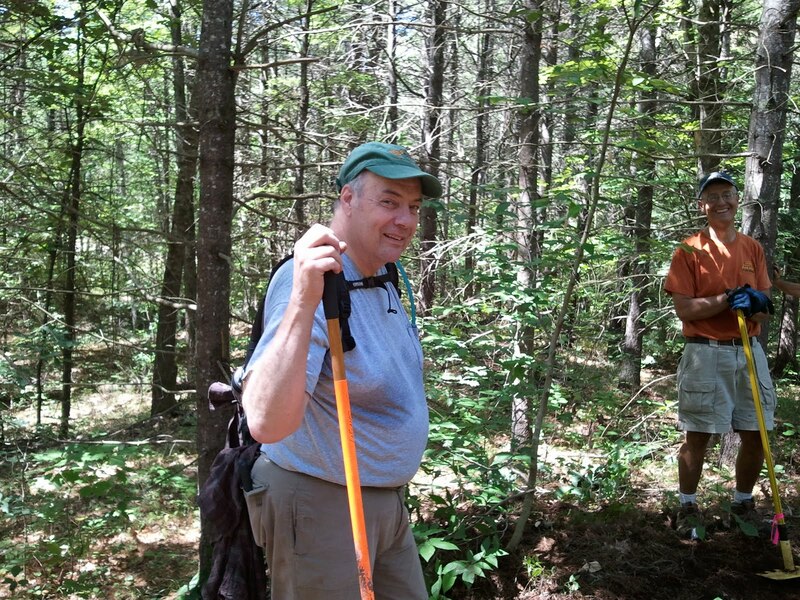 At the end of Whaleback, there is an open area with a fireroad and small sand pit. 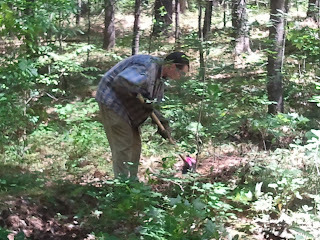 Normally we cross the fireroad and go up a short hill that leads to Stump trail or Mighty Chicken. Instead, take a left and follow the fireroad for ~200 meters or so to pick up Sniper. If you end up back at the entrance to Moose Gully or Whaleback, you've gone to far. Sniper is still Really soft in areas, but the flow seems good. I didn't notice any awkward spots that have to be reworked, but once it beds down and the trail gets faster things may change. It's a nice addition to the quiver at Franklin and my GPS showed that it was just over 1 mile long. Special thanks to Chris, Grant, Jesse, Steve, Barry, Barry, and Matt for working trail day at Franklin Falls on July 31st! 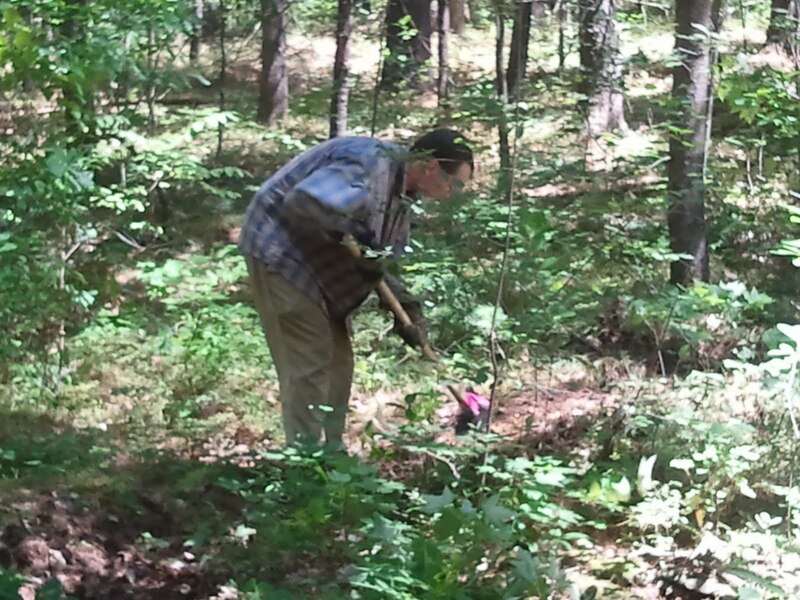 We continued work on the Sniper Trail, which had been started on May 15th. When completed, Sniper will be the longest trail at the dam, running from near the junction of Middle Trail and Caddywhompus to the junction of Moose Gully and Coleman Road. Overall, the trail is about 80% done with both ends of the trail built. A section in the middle isn't completed, but is scarred in. Anybody with a few spare minutes and some ambition can work out there without getting lost or off track. Try stay true to the scar marks, as they were precisely located to deliver the world class flow for which Franklin Falls is known. I'm told that a deviation of even a few inches will be detrimental to trail zen and even possibly to overall yin/yang balance of the cosmos. In other news, CNH-NEMBA's calendar is brimming with events. In addition to our standard Thursday night ride, we now have beginners' ride every Friday at Franklin falls, scattered Ladies' rides, and a Ride & Work night every other Tuesday at Page Hill.